Cat scratching the furniture, not getting along with the kids/other cats/dog, or having litter box problems? We can help. Want to teach your cat fun tricks? Cats can earn trick titles too! Contact us today for your private consultation or to begin training your cat. This is a great way to prevent unwanted behaviors with indoor only cats. Prices vary, contact us today for a quote. 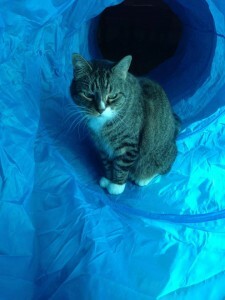 Wrigley working on his tunnel skills. This is just one of many fun tricks we can teach as we work towards earning a trick title for your cat!